Those simple words ignited heat in her belly. Or maybe it was that confident smile. She licked her lips. Oh. My. God. She took a deep breath, her heart drumming like tiny, nervous fingertips. He was just playing with her. She had to remember that. He cut her off. “I’m a man who loves beauty.” His gaze bathed her again, warming her with its intensity. “Very few people can say they’ve seen the light as it breaks through crevices in the rock, painting an underwater cave in a rainbow of colors.” He closed his eyes, the vision in his mind obviously blissful enough to raise his lips into a smile. Her heart pounded loud enough in the silent pause she was sure her microphone would pick up the beat. “What?” She held her breath. She exhaled. Jesus. He’s good. 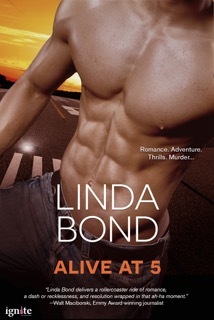 Come On A Thrilling Adventure Vacation in Alive at 5 by Linda Bond, Now On Sale for 99 cents!!! Now on SALE! Read the book that is described as a mix of James Bond and Romancing the Stone! Spend part of your summer vacation on a adventure with a TV news reporter and a thrill-seeking undercover cop while they search for a murderer and face their greatest adventure of all, love. Interested where the idea for Alive at 5 came from? Check out Linda’s blog post here! Not only is ALIVE AT 5 having a sale, but it also got a new cover! Check it out below! 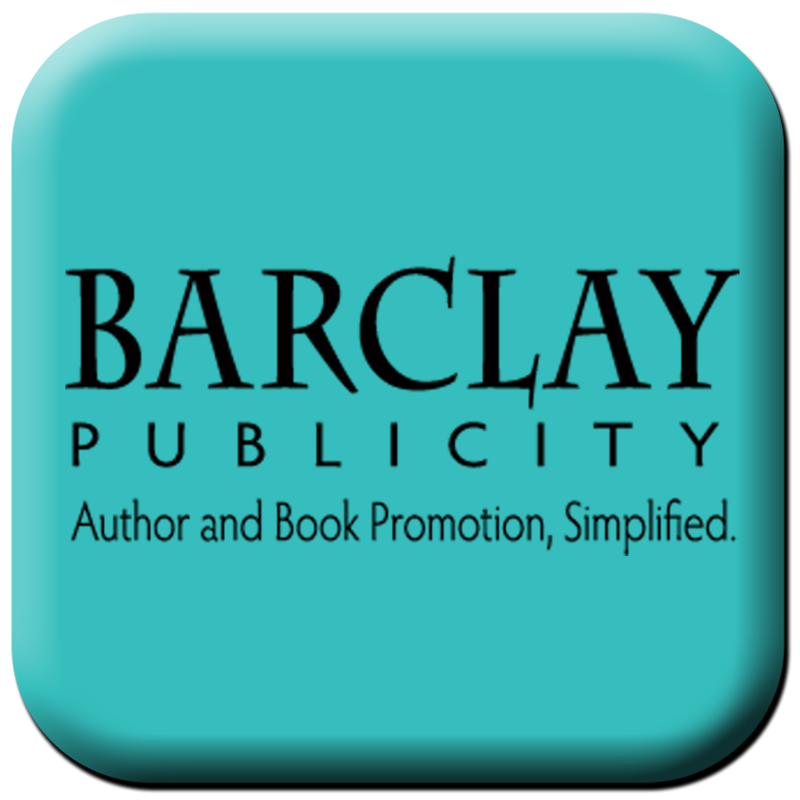 Don’t forget to enter to win a $25 gift card from Amazon or Barnes and Noble! Description: TV news reporter Samantha Steele is one panic attack away from losing her job. Future on the line and cameraman in tow, she follows her mentor on an exhilarating adventure vacation. When he dies while skydiving, her investigative instincts scream “murdered”, and lead her to gorgeous thrill-seeker Zack Hunter. Zack is an undercover police officer investigating his uncle’s death through the same adventure vacation company. Samantha is a thorn in his side the moment they meet. Not only is she investigating the same case, but the emotionally wounded loner doesn’t want another partner, especially one whose goal is to splash evidence all over the evening news. But Samantha’s persistence is quite a turn-on, and Zack’s overpowering desire makes it harder for him to push her away. When the killer turns his attention to Zack, Samantha might be the only one who can save him, forcing the anxiety-riddled correspondent to finally face her greatest fear. Check out the one of kind book trailer for Alive at 5 here! "What a Treat: Great Characters, a Clever Plot, and Extreme Adventures!" Linda Bond has a new release coming out soon called Cuba Undercover! Check out the exclusive book trailer here! Here is a never before scene excerpt from Cuba Undercover featuring Zach and Samantha from Alive at 5! “Nicely done.” Zack Hunter was right beside her, tall as hell and commanding in his presence. “Sam sent me over to rescue you. But once again, looks like you can get out of an uncomfortable situation without much help.” He grinned down at her. Zack’s confidence reminded Rebecca a lot of Antonio’s strength and power. Her heart fluttered at the thought of Antonio. But Zack was a more flirty kind of guy, winking and grinning, very unlike Antonio, who was always so intense and serious. “We’re over here.” Zack gestured toward the door to another room. “Did you have a chance to check on the case for me?” Her cheeks heated. She knew she shouldn’t be putting Sam’s fiancé on the spot. He was an agent for the Florida Department of Law Enforcement and could get in trouble for talking to a reporter about information in an active case. Now her checks were flaming. One thing she’d left out of her documentary was her growing attraction to and relationship with Antonio. “Well, he has a family here now to support and…” In fact, she hadn’t shared all the details with Sam, either. “He didn’t kidnap me, Zack.” Rebecca wished she had proof of what happened to both Ignado and Antonio, but even Esmeralda hadn’t been able to get info from inside Cuba. Rebecca furrowed her brow, a slight headache coming on. “Oh, right.” Rebecca glanced down at her black rented gown. “Thanks.” She’d forgotten how excited she’d been to wear it here tonight. That was before her trip to Cuba and before Antonio. “I’m fine. Thanks for the wine.” She raised the glass in salute to Sam, Dallas, and Zack, her friends all gathering around her in support. “Salud. To a great night.” She must concentrate on what was good right now. Friends, fame, and food. Unlike in Cuba, there would always be plenty of food here. Maybe in the beginning, but I became a willing participant. And now I miss Antonio. Damn it. She missed every damn thing about him. She especially missed the way Antonio made her question her every decision. He’d forced her to think. He’d been the force behind her growth. And she was a better person now for it. She felt enlightened. Familiar abuse or an uncertain future? Which would you choose? This is Laurel Lee Page’s dilemma when she is faced with an unplanned pregnancy at nineteen. Born into a broken family, guilt and shame are all she has ever known. No matter what she does or whom she meets, Laurel appears to be living a condemned life. However, she is determined to find independence and freedom in spite of her family’s legacy of hatred and self-contempt. Set in Southern California during the tumultuous 1960’s, Burnt Edges is a contemporary novel based on true events that prove strength can emerge in the most horrific of circumstances. 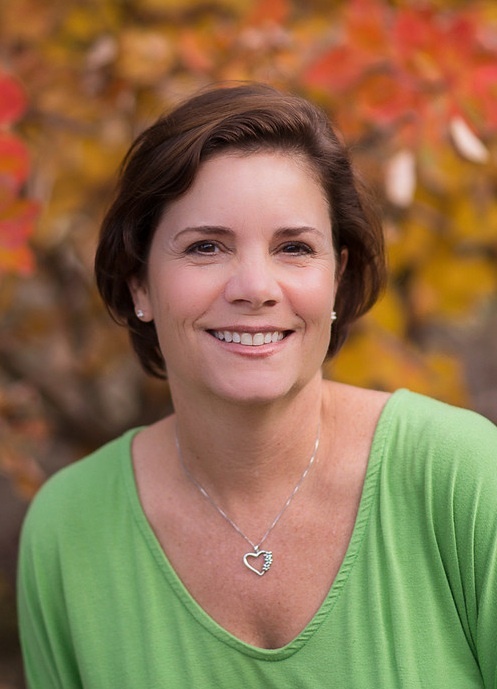 Dana Leipold is an author and member of the Association of Independent Authors. 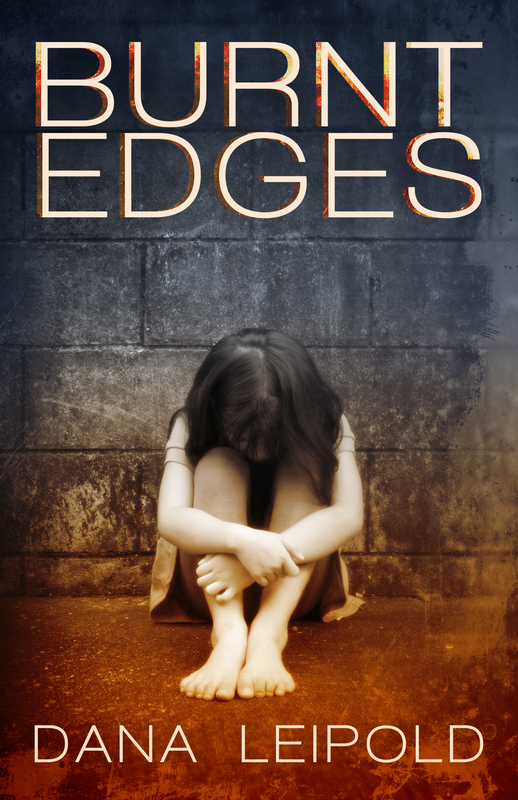 Her debut novel, Burnt Edges, depicts the unwavering resilience of a young woman in the face of family violence and abuse. She has self-published two other books: a collection of limericks in Dr. Seuss-style for adults entitled, Stupid Poetry: The Ultimate Collection of Sublime and Ridiculous Poems, and a non-fiction book entitled, The Power of Writing Well: Write Well. Change the World. Leipold lives with her husband and two children in the San Francisco Bay Area. 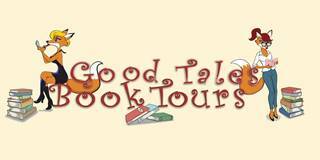 This tour was organized by Good Tales Book Tours! Who would you most like to sit next to on an airplane? I don’t fly anymore. But if I did, I’d prefer an empty seat. If I couldn’t get that, then I reckon Jesus would do. I’m sure he would have some good stories. Depending on the day, either Matthew McConaughey or Jabba the Hut. What's the best writing advice you've ever given? READ, READ, READ, and then READ some more. Read every book you can get your hands on. Read Steinbeck . . . The Grapes of Wrath and Tortilla Flat. In Grapes of Wrath, Steinbeck has one long paragraph that is just one sentence. It is beautiful writing, writing at its best. For those of you who are interested, it is the first paragraph of chapter three. Read it a few times to see the genius of it. What would be a typical working day for you? When and where do you write? I wake up around 2:00 a.m., then sit down at the computer and go to town. About the time the sun is coming up, I take my dog for his morning walk and shake the cobwebs outta my head. Then I go back to work for another few hours. I live on a boat and that is where I do my writing. When and why did you first start writing? Five years ago, I threw my TV out the window. Then sat down at the computer and wrote my first short story—140 short stories and three novels later, here I am. I started writing because I had to. Are you a big reader? If so, what are you reading now? I have read all my life. But I found that I could not read a book during the writing, editing or marketing process. When I did so, I neglected my work to finish the book I was reading; especially if it was a Lee Child or Baldacci novel. However, between writing books, that is all I do, read. What was the first book you remember making an indelible impression on you. Childhood’s End by Arthur C. Clarke. Making a big, tall drink that is 90% vodka. Andrew Joyce's MOLLY LEE is the sequel to his best-selling novel REDEMPTION: The Further Adventures of Huck Finn and Tom Sawyer. It is the story of a woman who knows what she wants and starts out to get it. Molly is about to set off on the quest of a lifetime . . . of two lifetimes.